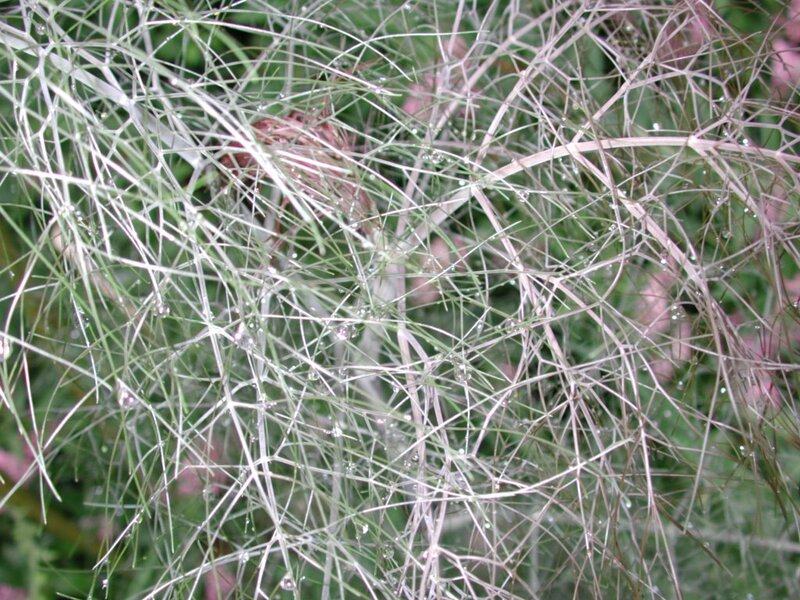 The Invasive Plant Atlas of New England’s (IPANE) mission is to create a comprehensive web-accessible database of invasive and potentially invasive plants in New England ... An important focus of the project is the early detection of, and rapid response to, new invasions. I emailed the following letter to National Public Radio (NPR) in response to their broadcast, yesterday, Monday, May 29, 2006, Tending 'Defiant Gardens' During Wartime. Today I recorded it over the phone with them for possible broadcast on Thursday morning. Regarding your broadcast, "Tending Defiant Gardens During Wartime," broadcast around 7:50am EDT, May 29, 2006. Thank you for this story, apt for Memorial Day. It made me think: How much "defiance" figures into my own gardening? The garden does not judge me. 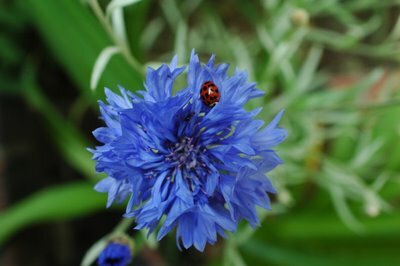 The insects and plants do not care if I'm angry or happy or grieving. Gardening connects me to something bigger than me, bigger than everyone. Through gardening, I can tap into a sense of time that dwarfs the brief existence of humankind, the source of all suffering in the world. It reminds me that, whatever happens to me, to us, life prevails. Gardening is an act of defiance because, no matter what people inflict on each other and themselves in the names of their gods, gardening demonstrates hope. The authors compare past distribution data from historical records, and current data from Brooklyn Botanic Garden's New York Metropolitan Flora Project to determine changes in distribution over the past century. They further compare these changes between native and introduced species within the same genus, such as Celastrus scandens, American bittersweet (native) and Celastrus orbiculata (or C. orbiculata), Oriental bittersweet (introduced, and invasive), or Lonicera sempervirens, Trumpet honeysuckle (native) and Lonicera japonica, Japanese honeysuckle (introduced, and invasive). We statistically analyzed 100 years of herbarium specimen data for woody plants in the New York metropolitan region in order to measure the floristic changes of this area. Change Index values were computed for 224 of the region's 556 woody species to provide a specific measure of whether these species are expanding, contracting, or stable. The results show that, in general, nonnative invasive species are spreading rapidly in the region, while native species are in slight decline. From the Western Front trenches of World War I to the deserts of Iraq, soldiers have found comfort in the simple act of gardening. Kenneth Helphand, writes about war gardens -- not just victory gardens, grown in time of scarcity, but those planted on hostile fronts, including Eastern Europe's ghettos and the Japanese-American internment camps of World War II. Helphand calls the gardens an act of defiance. How much "defiance" figures into my own gardening? The garden does not judge me. The insects and plants do not care if I'm angry or happy or grieving. I'm unfamiliar with the statistical analytical method of redundancy analysis used in this paper, and the charts were unintelligible to me. But the underlying thesis is intriguing, and underscores the importance of protecting and expanding biological diversity in all environments, even - perhaps especially - urban ones. It's never too late to start making things better for living and future generations. The unequal distribution of wealth in cities contributes to other forms of spatial, social, and biological inequities in complex, interacting, and self-reinforcing ways. ... Spatial variation in urban bird communities may also reflect socioeconomic variables and cultural differences among the human population. The purpose of this paper was to examine whether socioeconomic factors (such as mean family income and ethnic diversity) also relate to the diversity and abundance of birds in Vancouver, British Columbia. ... Results demonstrate that wealthier neighborhoods have more native species of birds and that these native species increase in abundance as the socioeconomic status of the neighborhood improves. With two-thirds of the world's population expected to live in cities by 2030, more and more people will grow up surrounded by a depauperate community of birds, and this could adversely affect the way people perceive, appreciate, and understand nature. Ultimately, as city birdlife diminishes and urban dwellers become dissociated from the natural diversity it represents, popular support for preserving and restoring such diversity may wane, allowing ecological conditions to further erode. The ant is hidden in the petals, just to the lower left of the ladybug. Invasive forest pests have seriously harmed our environment and imposed significant costs upon our economy. The U.S. Department of Agriculture (USDA) is the lead agency for responding to forest pests. This report evaluates the federal response to three invasive forest pests--the Asian longhorned beetle [Anoplophora glabripennis], the emerald ash borer, and the pathogen Phytophthora ramorum (P. ramorum) [Sudden Oak Death]. Specifically, GAO describes (1) the status of efforts to eradicate these species, (2) the factors affecting the success of those efforts, (3) overall forest health monitoring programs, (4) coordination and communication of the three pest response efforts, and (5) USDA's use of panels of scientific experts to aid in the response efforts. In August 1996, the first ALB in the United States was discoved in Greenpoint, Brooklyn. I garden just a few blocks south of Prospect Park and the NYC ALB quarantine zone. 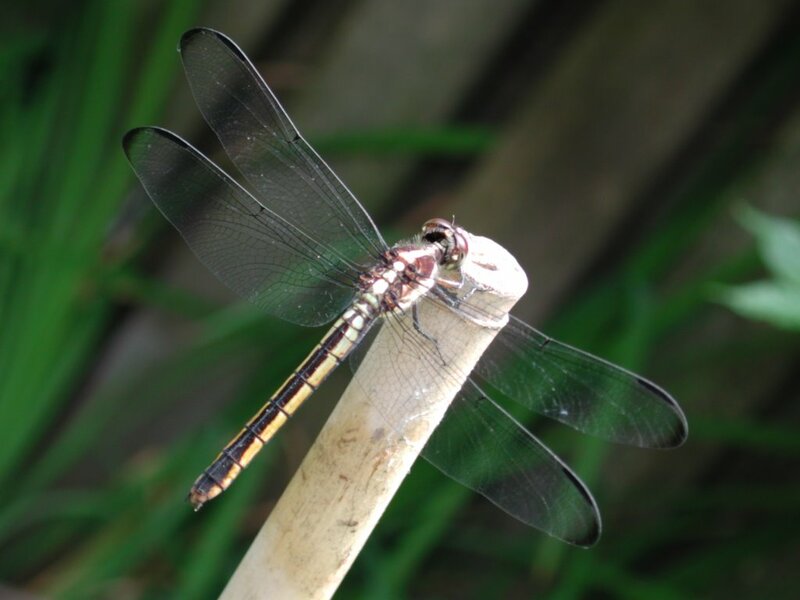 To learn how to identify ALB, and NYC's efforts, visit the NYC Parks ALB Home Page. A map of the city that shows where the bloggers are, organized by subway stop. Find out who's blogging in your neighborhood! You can click on the map to start exploring. The overview map will show you how many blogs are in each borough, and the borough maps will show you how many blogs are at each station. Click on the station to get the list of blogs. You can also browse by subway line, using the buttons on the right. And you can search for a specific blog by name using the search feature. ... I started the ISW in April of 2002, with two goals in mind: 1) Find a way to keep up with current events and 2) Find a way to keep up with current internet trends. With a public record of my efforts, I have found that I am less likely to "slack off" and stop keeping an eye out for important invasive species issues. New York, NY, April 24, 2006: Gotham Gardeners: Go Native! If you're a resident of the concrete jungle, you might be surprised to learn that you share your home with some 1,300 plant species that have been native New Yorkers far longer than any of the city's human inhabitants, having thrived through thousands of steamy summers and snowy winters here. Poem, June 24, 1997: "Planting is meditation ..."
Photo of the planting area and several containers and benches at Garden #2 in Park Slope. The view is roughly east-northeast. Note the fences marking the edges of the property, the trellis against the rear fence, the diagonal path leading to it, and the concrete in the foreground. The planting area from the concrete to the fences is only 10' deep and about 15' wide. Most of its edge is hidden by plants and containers. You can see the edge of the first stepping stone on the path to the trellis. Visible in bloom are, left to right, Corydalis lutea (low yellow mounds), Allium (tall purple/pink "space balls"), hybrid Aquilegia (yellow and red), and Iris siberica (deep blue/purple). If you view the full image you can also see the blooms of chives in the strawberry jar, hardy Geranium in front of the tall Allium, and Centaurea montana, to the right of the trough. There are at least two other flowers blooming visible in the photo, but I'm not sure what they were. Photo taken: May 26, 2002. The garden is 10 years old in this picture. 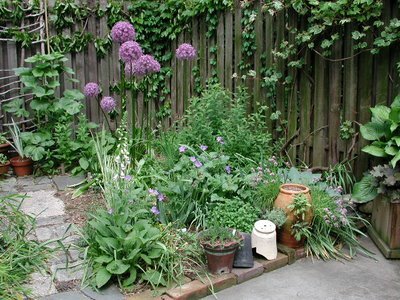 This is one of the last photos I took of this garden before I moved to Garden #3, also in Park Slope, with my partner. 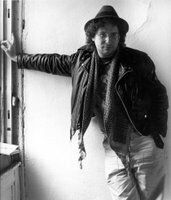 In 1992, I moved to Park Slope, Brooklyn from the East Village, Manhattan. How much to say about that move? It was neither easy, nor smooth, for me. For many reasons, it was more about abandoning myself, leaving unhealthy things behind, than feeling that I was moving toward anything new. To really let go, to allow my true self to emerge, I had to leave empty space in me and around me. I could not continue living where I was. I knew it was important that I have some kind of outdoor space in which to garden, even just a patio. At first, I looked for a new apartment in the East Village. But I couldn't find anything I could afford on my own, and I had lived alone long enough to know I wasn't ready to try to share with anyone. Though I rarely travelled out of Manhattan, I decided to start looking in Brooklyn, specifically in Park Slope because I had heard it was a gay-friendly neighborhood (it is). It was difficult to leave the East Village garden behind. After ten years gardening there, it had become a luxuriant and peaceful oasis. I had learned about the qualities of light and shade, how the shadows fall at different times of the year, the importance of selecting plants by form and foliage before flowers, the rhythms of life in a garden. Though everyone who lived in the building enjoyed it, I knew there was noone who lived there who cared about the garden, or understood it, as I did. My ex-lover had moved out of the city years before. I would have to walk away, knowing that I had created something beautiful, and hoping that someday someone would take my place as its caretaker. I came to be the first tenant of a young couple who had just bought a brownstone in Park Slope. (Actually, we're all about the same age; we were all so young then!) My apartment was the ground floor of the building, the garden apartment, with the entrance under the front stairs. Out the back door of the bedroom was a small, attached room, and beyond that, the backyard. My landlords later told me that one of the things which sold them on me was my response to that outside attached room. Everyone else who saw the apartment suggested "I guess you could use this for storage?" When I saw it, I exclaimed "A potting shed!" The backyard was at first intimidating. It was an unbroken expanse of battleship-gray concrete extending the width and back to all but the last ten feet of the property. There, on the only exposed ground, were placed (I would not say "planted") five shrubberies: a juniper, a pine, and five azaleas which bloomed, one week out of the year, a seering magenta. Amidst these was distributed a mulch of pine bark the size of dinner plates. This tabula rasa was a chance to start another garden from scratch. It had more sun and light than the shady East Village garden, even full sun during the summer. I could grow things I had only dreamed of growing: daylilies, Iris, Allium, and more. There were new challenges, lessons to learn, skills to acquire. I learned how to garden in containers. I learned what "drought-tolerant" and "constant moisture" really mean. I learned how to make and recycle potting mixes in bulk, cheaply and efficiently. I learned that cedar is not signifcantly more "rot-resistant" than pine when in constant contact with soil, and figured out how to reinforce and preserve wooden containers to get a few more years out of them. I learned to cope with, adapt to, and celebrate the ecstatic chaos of children in the garden. There was, of course, the idyllic sharing in the beauty of flowers, leaves, and insects. There was also the competing needs of two active boys playing basketball and fragile, ill-placed pottery. The basketball won on more than one occasion. I learned to garden defensively. And there was the afternoon the younger watched me plant and label a shipment of plants. It was not until I was almost done that I realized that, while I had continued, he had carefully removed all the labels from the plants and placed them back. He grasped the significance of what I was doing and emulated me. He had not yet learned to read. The plants gew and thrived, anyway, however anonymously. I lived and gardened there for ten years until 2002, when my partner and I moved in together at another apartment in Park Slope. A closer view of the planting area taken two years earlier. The diagonal path is not yet overgrown. In the foreground are some of the afore-mentioned broken pots, used here as decoration along the brick edge. A tableau of plants in five different containers. 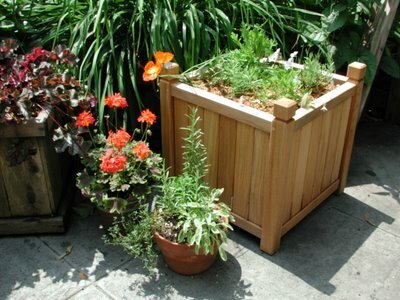 The container on the left is a cedar planter; the red-leaved plant spilling out of it is a Heuchera. In the foreground is a plain old terracotta "azalea" (3/4 height) pot planed with herbs: sage, rosemary and thyme, I think. Behind that is a hand-thrown Guy Wolff pot planted with a zonal geranium (Pelargonium). The container on the right is a teak planter I had just finished planting; a poppy and a pale-flowered violet are blooming in it. Behind them all Hemerocallis "Hyperion" spills out of a wooden tub planter, hidden in shadow. I built the teak planter from a kit from Wood Classics, an employee-owned business in Gardiner, New York. The slats are loose; they still have popsicle sticks beween them to maintain even spacing when the container was filled with soil. 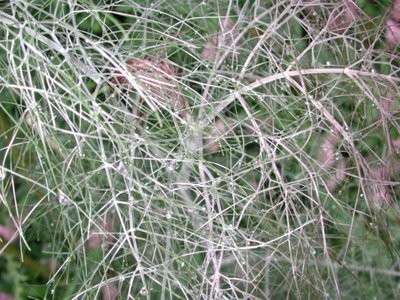 An article from The Ithaca Journal on an event which highlighted the threat invasive plant species pose to a local natural site. While there are some native plant species that can become invasive, most invasives hail from elsewhere, according to Bernd Blossey, an associate professor in Cornell's Department of Natural Resources. Blossey said he considers an “invasive” plant species any that can eventually overtake the native ones, becoming the dominant species in an area. In other words, not all non-native plant species are considered invasive, unless they start overtaking the ecosystem. He also said the best way to protect against invasive plants is to detect them early to prevent them from spreading. I first grew this plant in Garden #1 in the East Village. It was extremely long-blooming, blooming for months in the partial shade of the widlflower garden there. It forms a large clump over time. The ferny foliage is very effective and interesting when the plant is not in bloom. The native status of this plant is questionable. It is clearly planted and escaping in various areas. Some of the populations on Staten Island, and possibly elsewhere in southeastern New York, appear in "natural" areas. These may represent native populations, or they may be escapes from nearby residential developments. You gotta love a plant called "Gay Feather"! I first grew Liatris in Garden #1 in the East Village. It grew well even in the partial shade of that garden. The tall purple spikes were effective for a couple of weeks, and always drew comments from visitors. Note that both the NYFA Atlas and USA PLANTS maps for this species show scattered distribution among New York counties, and only in Queens within New York City. NYFA Atlas list this species as NOT native to New York state. 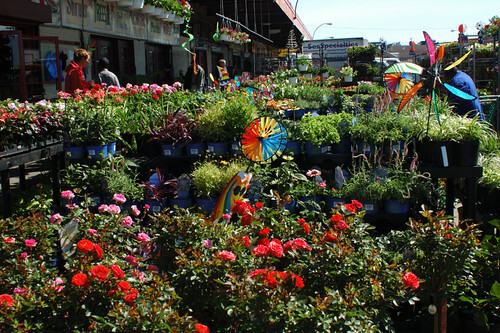 The purpose of the contest is to promote streetscape gardening in the borough of Brooklyn through block associations and other community groups. The deadline for 2006 entries is June 5. Five of the blocks in our neighborhood of Beverly Square West, including our block, were 2005 semi-finalists, and three of them were in 2004. This morning, some neighbors took me for my first visit to the Brooklyn Terminal Market. 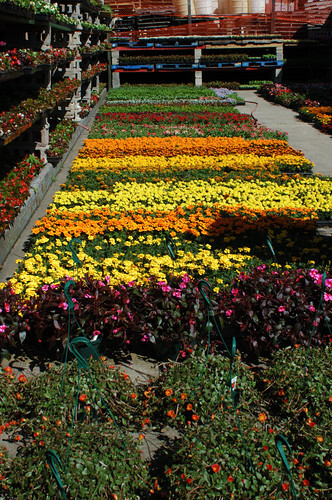 Several blocks of outdoor (this time of year, anyway) and indoor plants and supplies (fertilizers, mulch, and so on). I couldn't resist buying several plants. Dianthus caryophyllus SuperTrouper Dark Violet, Carnation, for windowboxes. This variety was the most fragrant, with a spicy clove scent, from all the varieties on hand. Heuchera "Color Dream", Coral Bells. These are one of the varieties of red-leaved Heucheras in the middle of the photo above. Liatris spicata "Kobold", cultivar of Dense Blazing Star, for native plant garden or sunny border/cut flower garden. You can see these in the foreground of the photo above. 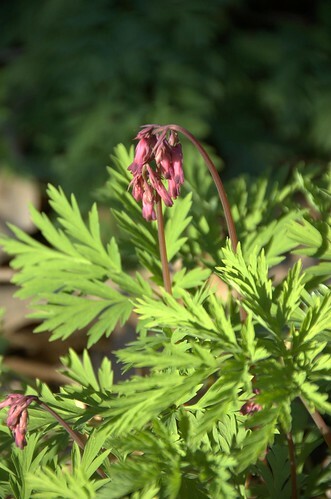 Macro photo of a single Columbine flower blooming in the backyard at Garden #3 in Park Slope. One of my favorite native plants and wildflowers. It looks so delicate, yet it blooms early spring, when temperatures are still cool. Columbine likes to grow among rocks. In the garden, bricks, stepping stones, and paths are good substitutes. Blooms early-mid spring, before trees have fully leafed out. If you keep the seedheads pinched back, you can keep it blooming for two months. Larger plants don't transplant well. 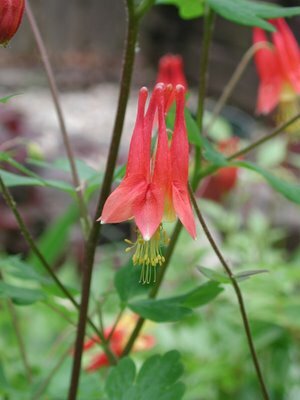 Columbine has a fleshy root which is easily damaged in transplanting. It tends to not form a root ball, which makes it difficult to avoid damage and get the plant re-established in its new location. Columbine is not a long-lived plant. Five years is a long time for a single plant. 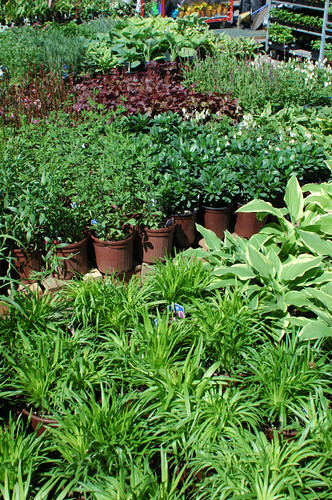 However, you can easily get more plants than you need through seed propagation. Where you want Columbine to grow, plant one plant and let it go to seed. You can also collect seed from your plant and scatter it where you want more. Seed must winter over to germinate. It may take a year or two for new plants to establish themselves before they bloom. Leaf-miner can be a problem; I find it's less of a problem with the species than with hybrids. The miners tunnel inside the leaves, beween the upper and lower surfaces, as larvae. They create distinctive widening, wandering trails; hold a leaf up to a light and you can actually watch the larvae chewing away inside the leaf. When they've had their fill, they cut a hole through the underside of the leaf, pupate, and drop into the soil. They emerge as flying adults to mate and lay eggs in new leaves. Dispose of affected leaves in the trash; don't compost leaves or affected plants or soil unless you know your compost gets hot enough for sterilization. I just saw a male Magnolia Warbler (additional link) in our neighbor's apple tree early this evening, just before dusk. He was darting around the tips of the branches. He looked like he was foraging for insects among the leaves. Because he was at the ends of the branches, instead of the interior, and because I was watching him from our upstairs back porch, I was just a few feet away. I got several good looks at all sides of him, so I'm confident of the identification. I've seen them before, at our old place in Park Slope. This is the first I've seen one at our new house. They're beautiful birds. The place name "Flatbush" is an Anglicization of one of the early Dutch names for the area. I've seen the Dutch variously given as vlacke bos, vladbos, and flakkebos. I've seen this translated as "wooded plain", "wooded land" and "flat woods". In other words, the name describes the landscape prior to Dutch colonization of the area in the 1600s. Much of the area remained farmland and relatively undeveloped through the 19th Century. The last vestiges of these original woods were lost with Victorian-era development in the 1890s. The East Village was the site of my first garden in New York City. My second lover in New York lived in a tenant-owned brownstone on First Avenue. When we were breaking up, he proposed a project for the two of us to work on together: turning the backyard behind the building into a garden. The space was dominated by two mature Ailanthus trees which, along with the buildings to the south, shaded the yard almost completely. On the ground grew nothing but liverworts and Ailanthus seedlings. In and on the ground were the remains of a back building which had been torn down a few years before. We planted bulbs in the fall. I labelled everything. Friends remarked that it looked like a plant cemetery. In spring the first bulbs came up. We were ecstatic. The garden continued to be developed and enhanced over the next few years by us, building residents, and other neighbors. One of the residents, a carpenter, built a deck over the broken concrete patio. One afternoon we had a load of topsoil delivered. Since there was no access to the backyard from the street, the truck dumped it all in a pile on the sidewalk. Neighbors pitched in and, with shovels, buckets, and a wheelbarrow, moved the soil through the building to a new pile in the garden. We learned about shade gardening. Wildflowers, ferns and hostas created a shady, green, cool oasis - a sanctuary from the noise and heat and, to be honest, stench of the street. It took five years for the garden to feel completed. 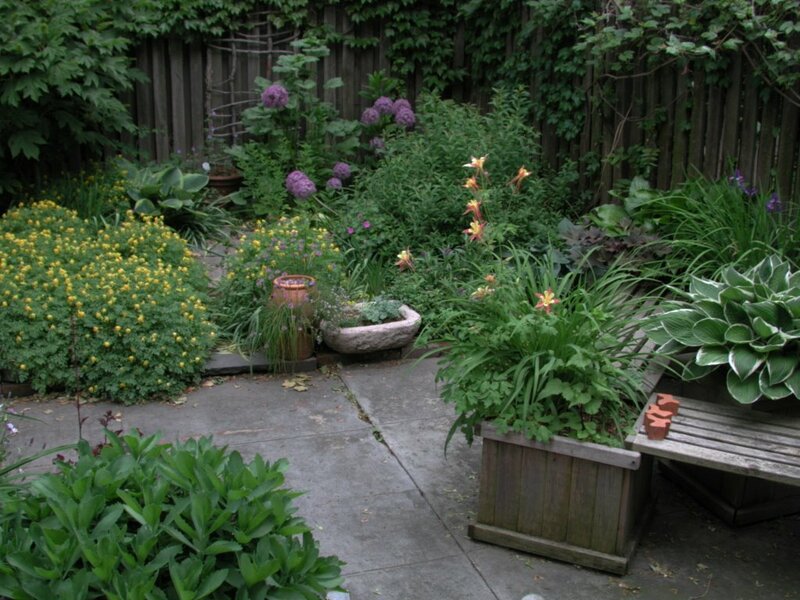 I continued to care for the garden until I moved to Brooklyn in the early 1990s. All my records and photographs of the garden over those years didn't make it with me. Dug bed in backyard to left of maple, along wooden fence. Worked in coir/cocoa fiber, HollyTone, Hydrogel. X-planted Royal Fern + Ostrich Fern. Planted Old House Gardens Dahlia "Union Jack" & Tuberose in Guy Wolff pots purchased last year.